July is National Pickle Month! Who Knew?!? • Pickles can be a great food for snacking — they are crunchy, sweet and salty. Look for lower-sodium versions of your favorites, as pickles can be high in sodium. • Pickles can be a great appetizer. Place some pickle spears or chips in a small bowl for everyone to taste. • Try making your own. Experiment with flavors by searching for recipes online or in cookbooks. A mixture of vinegar, salt, sugar, and spices are used for all pickles, the different proportions create different flavors. 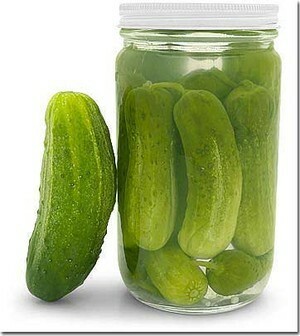 Place sliced cucumbers and pickling mixture in an air-tight container in your refrigerator to make easy pickles. Flavors will be well blended after a few days.